The Kondo (Golden Hall) and the five-story pagoda at Shitennoji Temple in Osaka. Both are based in the center of the temple buildings. Shitennoji Temple was founded by Prince Shotoku (Shotoku Taishi, 574-622) in 593 during Japan’s first wave of temple construction. 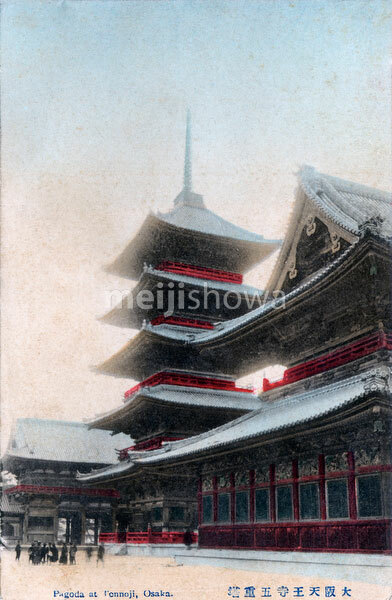 The Kondo and the pagoda, were completely destroyed by US firebombs in March 1945. In the early 1960s, they were rebuilt in concrete.